I've moved to blog.boora.ca, please head over there for more content. Well, I've joined the others on my feeds by getting my own domain and moving off of Blogger. It's been good to me, but at the same time, I think having my online presence in one place is a better move on my part. I'll keep this here for a while, at least until my new blog gets picked up in search engines and the like. Continued on my new site. I've been reading Tipping Point by Malcolm Gladwell and am currently going through a section on what he calls "stickiness". The elements that make a message stick, and as an example he used Sesame Street and Blue's Clues. Up to the point that I'm in right now, I think it's a great chapter for all instructional designers to flip through, especially those working with younger children. So for those building a reading list (like mine), I would be sure to add Tipping Point. 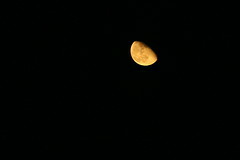 It's not the moon from last night - I couldn't get a decent shot from where I am in the city, but this one is pretty good as well. Hopefully I'll be able to get some extension tubes in the future and up the length of my lens (unless I get lucky and someone gives me a 300mm) to get closer, but in the mean time, I've got a good setup for training. A colleague passed this on to me - the MouseSite that shows the demo that was the first use of the mouse a well as many other technologies that we are just now starting to use. More blogs about game learning. More blogs about Instructional Technology.